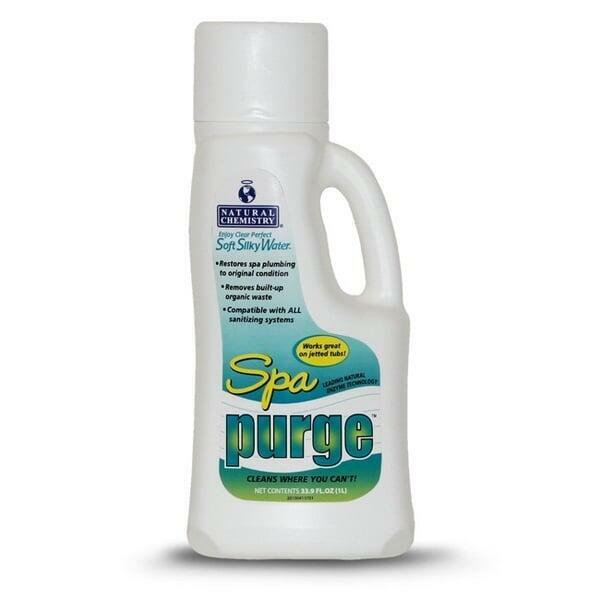 Spa Purge features a powerful acid-free formula that deep cleans spa and hot tub plumbing. A thorough plumbing clean is necessary before the initial fill of your spa, and with every regular water change. The highly concentrated, acid-free formula will deep clean the plumbing by removing unwanted buildup of organic material and debris. It attacks the root cause of maintenance problems caused by non-living organic contamination like oils, lotions, cosmetics, hair products, sweat and more. These contaminants collect and build in spas, from the circulation system to the filters. By purging the spa with Spa Purge, the symptoms of these contaminants can be reduced and eliminated. Restore the perfect operation of your spa's plumbing system today! Be sure to read the directions on the bottle before use. Add one (1) bottle (bottle contain 1L/33.9oz) to any size spa or hot tub. Let sit for at least 12 hours. For Jetted Tubs: Let the jets run periodically, but do not let Spa Purge overflow the waterline. Spa water temperature needs to be more than 95°F to add Spa Purge. Chlorine/sanitizers above 6ppm may deactivate product. Safely dispose of water directly onto lawn without fear. Acid-free formula looks like a cup of coffee. Be sure to check out other Hot Tub Supplies.